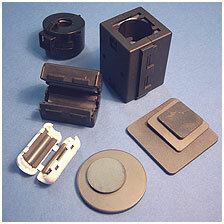 We stock a range of Low cost EMI Vent Panels for use with 40mm, 60mm, 80mm, 92mm & 120mm fans. 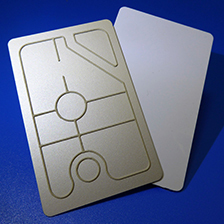 They provide EMC shielding where applications demand a low cost solution, whilst still providing an adequate shielding performance. 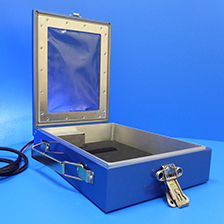 These are available ‘off the shelf’ for fast delivery and significantly more cost effective if small volume shielding vents are required. A Hi-impact ABS UL94-HB fire retardant moulding is fitted with one layer of 3.2mm cell x 6.35mm thick honeycomb and a nickel over copper plated fabric over foam gasket to ground the honeycomb to the metalwork. 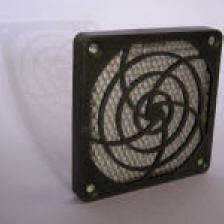 The vents have 4 countersunk holes to suit standard fan mountings. A Hi-impact ABS UL94-V0 fire retardant moulding is fitted with two layers of honeycomb at 90 degrees (cross cell) to ach other. One layer of 3.2mm cell x 3.2mm thick honeycomb, one layer of 3.2mm cell x 5mm thick honeycomb and a nickel over copper plated fabric over foam gasket to ground the honeycomb to the metalwork. The vents have 4 countersunk holes to suit standard fan mountings. 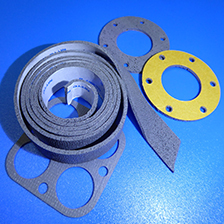 Aluminium/Stainless filters offer high levels of air passage while efficiently filtering contaminants and shielding EMI/RFI. Their tightly woven stainless corrugated mesh screen offers the highest performance. Designed to fit all 60mm, 80mm, 92mm, 120mm and 162mm tube axial fans, filters may be mounted directly onto the fan or to any other housing.